About a month ago, many of us participated in the American tradition of Thanksgiving where we pause for a day of gratitude and express thanks for all we have and all we’ve been given. Hours later, many of us participate in yet another American tradition, Black Friday, where we venture out in the middle of the night and stand in line at stores to hunt for deals on things we really don’t need. This year, however, I refused to let go of “Thanksgiving” so easily. After reading this, I started to think about the loving yet critical conversation Guru Sahib would have with me about my “day of thanks.” With as many gifts as we receive each day, each minute, each breath…is one day of thanks really enough? Instead, this pauree tells me that thankfulness is not a day or a moment…instead it is a lens in which you view life. Truth is, we often cannot control the events that happen around us, but we can control how we view them. Personally, I’ve come across a handful of individuals in my life who have experienced tragedy or immense hardship, but when asked about it, they only emit thankfulness for the challenges Waheguru has entrusted them with. This is where I want to be. 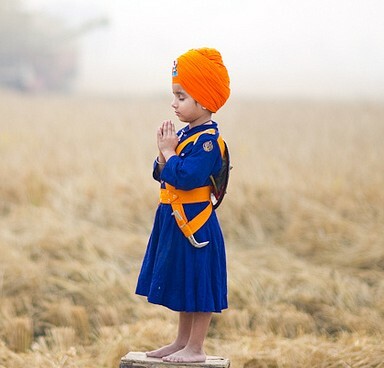 To be so connected with Akaal Purakh and in acceptance of his will…where all I feel is thankful. And as a parent, with any lesson I try to teach myself, I ask what I can do to pass this lesson on to my children. How do I help my children view life through a paradigm of gratitude? Interestingly, I notice a similar change in my own Ardaas. The hope here is by expressing thanks for all the big things, little things, and everything in between…thankfulness no longer becomes something you even have to think about…it simply becomes a way of life.